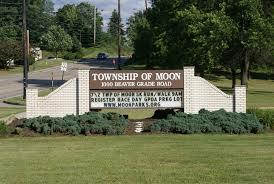 Moon twp. is one of the Pittsburgh’s largest township’s and used to be the home of Pittsburgh’s International Airport’s until early 1990’s when it relocated to Findlay twp. The township has a large residential area and home of many major corporations and Robert Morris University. It has easy access to major highways and shopping areas.